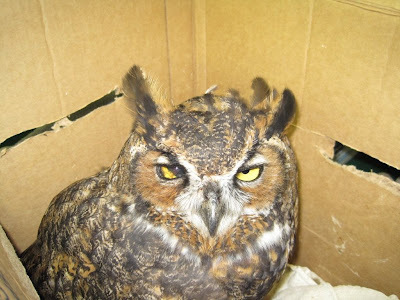 Last night two Great-horned Owls were admitted within minutes of each other. They came from areas about a 50 miles apart. The bird in the photos is from the Wausau area. 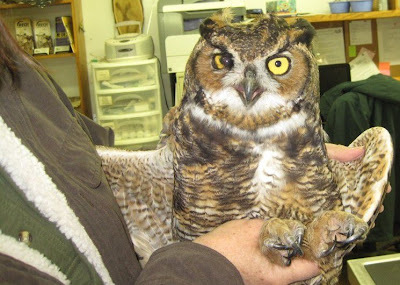 He is a young of the year male Great-horned Owl. He was probably hatched in February of 2009. This owl has an old eye injury. The injury could have occurred months ago. It has caused some visual problems, and possibly some hearing loss. The owl does have some vision in the affected eye, however the eye and the ear are very close in owls. In this case there is still significant bruising in the ear canal. Owls use their hearing for hunting even more than their vision! 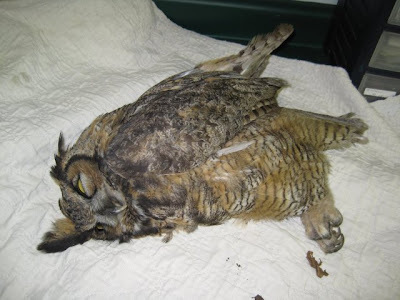 For an owl that is not yet a skilled hunter, that can be a serious problem. The youngsters parents would have continued to be active in his life until this month. After October the young are pretty much on their own at least as far as hunting. When the time for independence occurred he was unable to hunt adequately enough to survive. Finally, he was weak enough to be captured. Once this young owl is stable we will be able to access his ability to hunt and better understand if he will be able to be released again to the wild or if he will need captive placement. REGI's own Steve Fisher, our Environmental Education Coordinator, braved the snow and wilds of Wisconsin to rescue this bird. Given our rural location, that is often no easy task. The Great-horned Owl in the photo above may look like he has gone on to Great-horned Owl heaven, but he has not. This photo was taken when he arrived and was still suffering hypothermia. He was rescued by some caring folks that saw him on the side of the road and wanted to help. He does not have any broken bones. He can move his legs, but likely has an injury to his spine. He is much more aware now and is improving. Spinal injuries in animals are just as serious as those in people. They need lots of supportive care and physical therapy. Time will tell if this owl will fly again. Meanwhile, we will continue to tube feed him and offer supportive care. 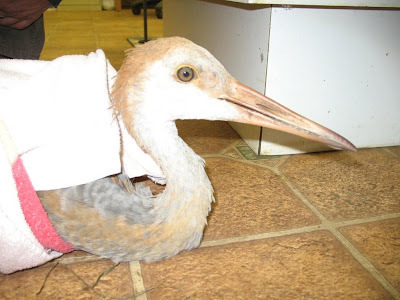 A young Sandhill Crane was admitted last night. She had been hit by a car in Adams County. She has several fractures and is in very critical condition. She was likely hatched in July as she is still in very immature plumage. 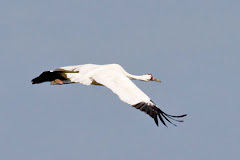 The weather this summer was so cold many Sandhill Cranes lost their first attempt at nesting to freezing temperatures. Some pairs nested again. That is what probably what happened to this family. We were not sure what was going on when young fledgling Mourning Doves began flooding the REGI clinic. They were out of the nest, but still being fed by the parents. Young doves are fed "crop milk" and therefore need the adults even more some other bird species. The situation became clear however when we realized Mourning Dove "hunting season" had opened. It is disgusting and just wrong when parent animals are killed for sport, particularly when they still have young in the nest or are dependent on them. Somehow, it becomes our responsibility to then care for the starving youngsters so someone can have target practice. Chicks that were still in the nest would have starved without intervention if they were not found. I cannot help but think someone needs to examine the ethics of the dates of that season...and the season itself but that topic is for another day. All of the birds admitted Tuesday and Wednesday were reported by members of the public that saw the helpless birds and seized to chance to help. We are so grateful when the public steps in to help wildlife. 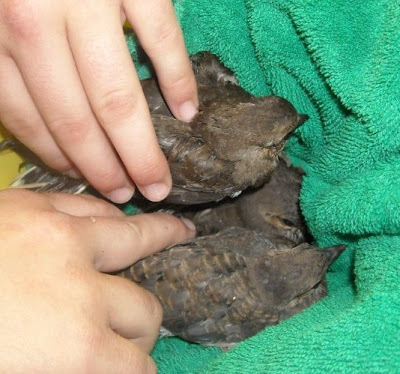 Several years ago the state wildlife agency may have helped rescue wildlife. Budget cut-backs of the past fifteen years have changed state employees ability to be involved in wildlife rescue. Now it is up to the public and non-profits such as REGI to help. Thanks everyone for doing your part. Another busy day today as we ready the Turkey Vultures for their trip to Oregon and their new home.